Perfect your life by association with a pure devotee of Krishna! Srila Prabhupada is living in these films and videos and we can benefit immensely from his association in this transcendental form. "By association with pure devotees, dirty things within the heart are gradually washed away by the grace of the Supreme Personality of Godhead Krishna." Now available on USB Thumb drive. Srila Prabhupada did not leave us in 1977. He is still spreading Krishna consciousness all over the world. Prabhupada lives in in his teachings and we can continue to associate with him, a pure devotee of Krishna, and continue to benefit. The "Complete Prabhupada Video Library" is the perfect opportunity to personally associate with Srila Prabhupada! In this final edition, the film and sound quality has been stunningly improved. All the original films and videos have been digitally re-mastered. New footage has been discovered and included, the sound has been enhanced. The result is Prabhupada, as you have never seen before! The improvements are truly breathtaking! I already watched two DVD's and I realized once more how wonderful Srila Prabhupada is even it was just for looking at Him what to speak of simultaneously hearing Him speaking attracting us souls to Him and Sri Sri Radha Krishna. Thank you and my joyous obeisances to all of you who did this wonderful service to produce this library. I would like to stay in contact and share some more. 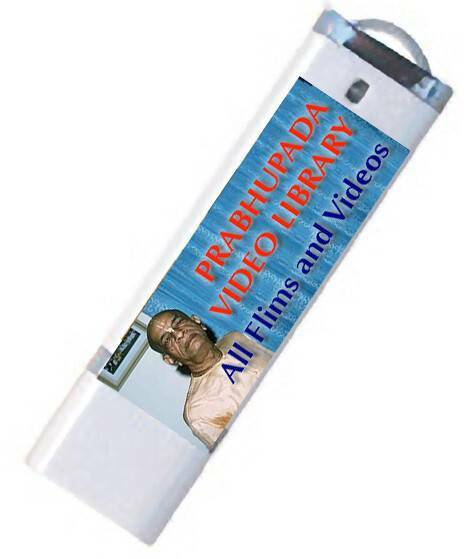 The Prabhupada DVD library is professionally produced on 19 duel-layer DVDs, improving the quality while reducing the cost. These DVDs will play on any DVD player, anywhere in the world. The Prabhupada DVD set has subtitles in twenty languages and the new option of Russian and Italian voiceovers. A short sample from the "Guide to Self-Relization" DVD. This DVD contains five programs, the famous "Acharya Series." First-class documentary films featuring Srila Prabhupada as he travels around the world preaching Krishna consciousness. "Happiness on 2nd. Avenue" is a sample program from the "Vintage Short Films" DVD from the Complete Prabhupada DVD Library. It was produced as a news documentary by CBS News in 1966. This DVD contains many fantastic short films made in 1966 and 1967 on Srila Prabhupada's Hare Krishna movement. Other shows on this DVD include: "Matchless Gifts", "Vaisnavas", "Swamiji", "Second Ratha-Yatra Festival", "The Full Nectarine", "Gurudeva", "Who is Krishna?" This DVD allows you to experience the birth of the Hare Krishna Movement in the Western World, in New York City, NY. This is a sample program from the "Prabhupada in Australia" DVD. It was produced by combining 16mm news film from many different television stations. It shows Srila Prabhupada arriving in Australia and the press conference that follows. A truly remarkable program. The "Prabhupada in Australia" DVD is truly amazing. It includes Television News documentaries, Initiation Ceremonies, Preaching Programs at Halls, a University, The Franciscan Seminary, The Ratha Yatra Festival, Morning Walks, the Installation of Sri Sri Mahaprabhu in Melbourne, and much more. From the "Festivals With Srila Prabhupada" DVD. This is an amazing coverage of the 1975 Philadelphia Ratha-Yatra Festival. "Festival of the Chariots." This DVD also contains films from other Ratha-Yatra festivals and a wonderful program on Srila Prabhupada's Vyasa-Puja Festival at New Vrindavana in 1973. One of my favorate programs on the whole "Prabhupada DVD Library." This is a short sample from the 45 minute coverage of Srila Prabhupada installing the Sri Caitanya Mahaprabhu and Lord Nityananda Deities in Melbourne, Australia. It is an incredably beautiful professional produced film funded by the Australian Film Board. You have to see it to experience it. A great surprise! We recently discovered this 30 minute professionally produced film on the Hare Krishna movement in Germany in the mid 70's. It documents the entire Hare Krishna movement in Germany at the time and includes a visit by Srila Prabhupada and an initiation ceremony. This is one of the many programs on the "Prabhupada on Tour" DVD. The DVD also contains programs covering Srila Prabhupada's travels in the United States, South America, Mauritius and India. This is a sample of our newly improved B&W footage. Using the magic of digital image processing the quality of all B&W footage has been improved dramatically. In some cases, as you see here, we have been able to find color footage shot at the same time and have incorparated that to give a much better experience. This is from the "Festivals With Srila Prabhupada" DVD. Part 4: This program focuses on Srila Prabhupada's daily devotional practices with his disciples. It starts with Srila Prabhupada and some of his leading disciples on Srila Prabhupada's daily morning work on a beach in Los Angeles followed by the Hare Krishna morning temple program and Srila Prabhupada giving Srimad-Bhagavtam class to the devotees and then a wonderful Hare Krishna kirtan, plus many other interesting features. Part 5: This program includes many short segments, starting Srila Prabhupada's morning walk, followed by Prabhupada discussing Krishna consciousness with a university professor, a conversation with Srila Prabhupada in his garden at New Dwarka, Los Angeles, a talk to Prabhupada's leading disciples about book printing and book distribution, and very interesting conversation between Srila Prabhupada and a social worker and this program concluds with Srila Prabhupada discussing Krishna consciousness with a psychologist. San Francisco 1972, Philadelphia 1975, Morning Lecture SB 6.1.27, Ratha-yatra Parade, Prabhupada's Public Address, Vyasa Puja 1973. New York Airport, Arrival in Pittsburgh, Social Work, Speaking to Parents, Speaking in Car, Bali Mardan's Wedding, Prabhupada Nectar.